I am honored to be kicking off the Grand Opening blog hop for the Needle & Foot Etsy shop. Bernie has filled her shop with some beautiful fabrics! In addition to the giveaway at the end of this post, Bernie is offering everyone a coupon code to her new shop. Use the code NANDFREADERS15 for 15% off any order over $5.00 (the coupon code will be active through Sunday,3/26). 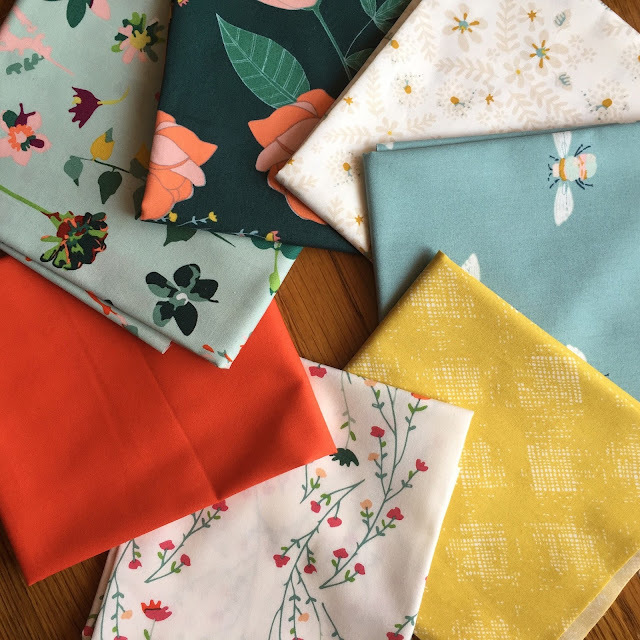 For the hop, Bernie sent us the listing of different collections she had ordered for the shop and I immediately went to Maureen Cracknell's new line, Garden Dreamer. I love Maureen's collections, she has such a way with combining colors and prints. That they are on Art Gallery's wonderful cotton substrate is another bonus. My goal with this bundle was to make a baby quilt for my son's teacher who was due to have a little girl (I actually gifted the quilt before the hop, his teacher loved it, and had her new baby girl last week). 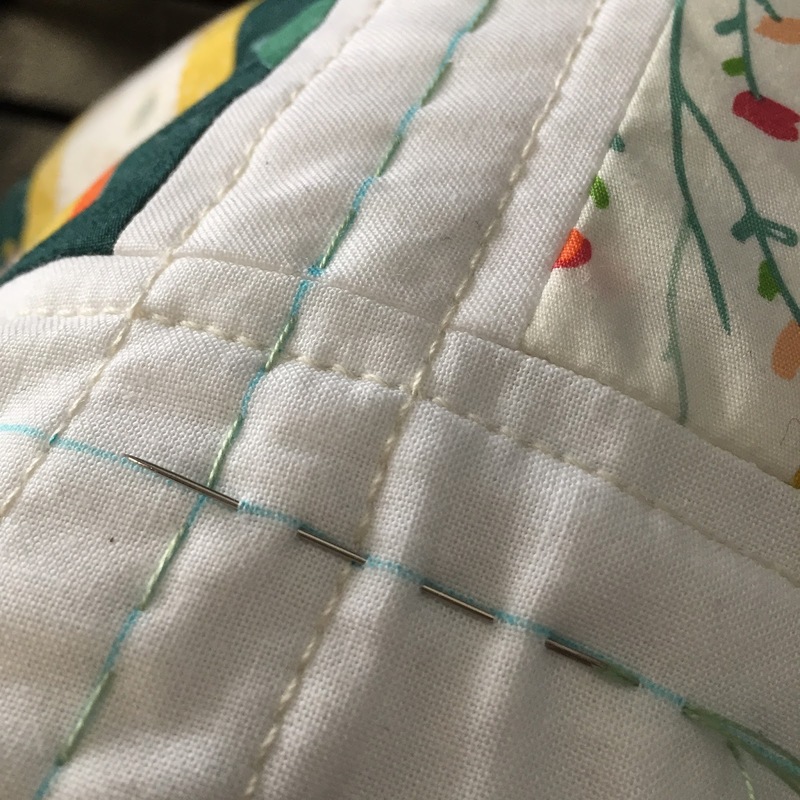 I wanted to keep the quilt as soft and snugly as possible so I first quilted by echoing the seam lines around the blocks using some Sulky light cream thread in 12 wt. I used the 12wt as the top thread and a 40wt thread in the bobbin, plus a larger needle to handle the thick thread. The thick thread quilted wonderfully without any issues and created good impact in the quilt. I wanted to add a little extra touch so I added some big stitch hand quilting between the machine quilting using a light green pearl cotton. I backed the quilt with an old Denyse Schmidt print that I think complimented the gold/yellow print in the quilt top. Your choice of either 6 fat quarters or 3 half-yard cuts selected from any of the available fabrics at the Needle & Foot Etsy shop. 1. Hop over to Instagram and follow Needle & Foot. 2. Go over to Facebook and follow Needle & Foot. Then, leave a comment on this post with which option you completed. The giveaway will run for 1 week, until 8 pm EST on March 27th. I try to respond to each and every comment I get on my blog, but with giveaway posts the numbers are usually too great to do this. PS - If you are a no-reply blogger, please leave your e-mail address so I have a way of contacting you if you win. The winner (selected by Random.org) was comment #61, Kathy E.
No IG account but I will follow on FB. I really like how the quilt turned out. Lovely. Love this quilt, and glad that I am now following Needle and Foot on Instagram! Gorgeous quilt; I agree that amazing fabric can make a quilt! I follow Needle and Foot on Instagram. I'm following Foot & Needle on IG. I am now following through Facebook. Love your baby quilt, and your choice of fabrics makes it look more sophisticated. I follow Needle and Foot on FB. I am a follower on instagram now. Love your quilt very much! I'm following on instagram now. Your quilt turned out beautiful and what a wonderful gift! I decided to follow on Instagram and Facebook. Love your quilt. I follow Bernie (needleandfoot) on IG...I deleted my FB account a couple of years ago after a major hack and haven't been comfortable to renew it. I LOVE these fabrics as I am a beekeeper....simply adorable! I follow Needle and Foot on Facebook! Thanks for the chance to win! Love your quilt, too. Bet the new mom is enjoying it! Oh, I've already been following on IG and I've had her shop as one of my favorites. It's all fun! 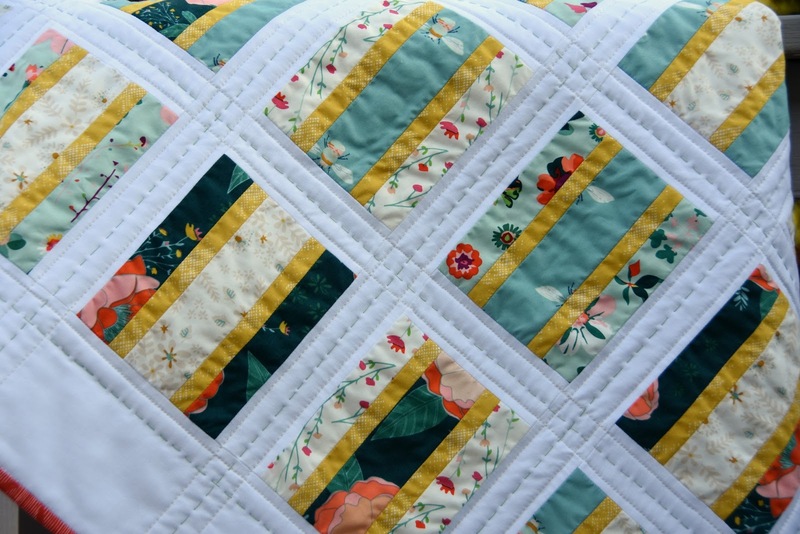 Oops - I meant to tell you I really like your hand quilting on this quilt - perfect! I'm following on both Instagram and Facebook. Beautiful fabric! I follow on Instagram. Love your quilt!! What a great quilt!!! I follow through both fb and ig. I always welcome quick quilt ideas for baby quilts. They always seems to be needed. I am following Needle & Foot on IG. Love the quilt. I've never used 12wt in my machine and will have to give it a try! I follow them on Instagram. I follow NF on FB. I actually did both because I want to keep up with all the information I can. thanks for the giveaway. I am following on Facebook. Thanks for the giveaway my fingers are crossed! I am following on FB. Love your quilt. Happily, I now follow Needle and Foot on IG-good luck with the new shop! I don't do Facebook or Instagram, so cannot enter. I do follow NAF on Bloglovin. wigglypup2. I also follow them on FB. Thanks for the chance to win! Love your baby quilt! I follow Needle and Foot on FB. I follow Needle and foot on IG. Your quilt is wonderful! I love the added touch of the big stitches and the binding! Some little baby is going to love this for years to come!! Garden Dreamer is a beautiful new line...love the bee fabric! What *sweet* baby quilt! Love the detail of the hand stitching. I follow Bernie on IG and now on FB too! I just became a follower on Instagram. Thanks to this shop for the giveaway. I am now following her on Instagram. What a sweet quilt! I love the combination of machine quilting and hand quilting that you did. I follow Bernie on Instagram. Thanks for the giveaway! What a cute baby quilt and I love the hand and machine quilting combination. I follow needle and foot on Facebook. Love your quilt. thanks for sharing the quilting ideas. I am starting a baby quilt and would love to try this. Following on FB .. I love the colors on the fabric line. I chose BOTH options because I don't want to miss a thing! Love you quilt and enjoyed your post. Following on Instagram. Love your baby quilt! Congrats to Bernie! I've been her follower on IG for a long time! I follow on Instagram. Thanks for the giveaway. Love this quilt pattern. Perfect for these fabrics. I followed Needle and Foot on IG. To Facebook and followed Foot and Needle! THANK YOU FOR SHARING! I did both as it seems like a good online store to follow. :-) Thanks for the chance! I believe you meant Needle and Foot? I was already following on Instagram and liked Bernie's Facebook page. I wish her nothing but good times with her new shop. Cheryl, your quilt is filled with sweet touches that I simply love! Terrific job. I love the Garden Dreamer prints! So perfect for a baby quilt. Following on IG. Nice to have this kickoff on the first day of spring. Your fabric choice reminds me of what is ahead in spring, just not here yet. I am now a Facebook follower. 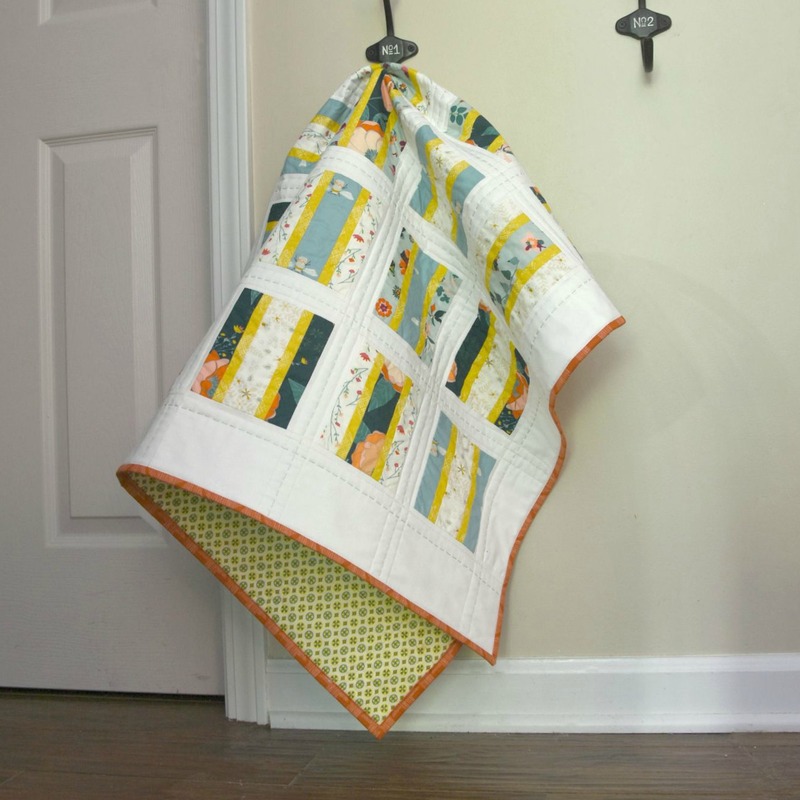 Love your baby quilt and interesting about the thread weights you used for quilt. The quilt is awesome inspiration. Such a sweet baby quilt! I follow Bernie at needleandfoot on IG. She is very helpful and has great stuf! Great fabrics for a baby quilt and I love the hand quilting detail! Thanks for the intro to Needle and Foot. I followed over on IG. I followed on IG. I don't do Facebook. I don't do FB, Instagram, Pinterest, etc. Maureen's fabrics are nice and so is your quilt. I'm following on IG. Love your quilt! I love beautiful fabrics so it was easy to follow on FB. Pretty new baby quilt and I am in love with the quilting on it. Fabulous job and wonderful gift. I follow on facebook. Love the quilt, and the colors! I follow you on IG. Thank you! Now following Needle and Foot on FB. I follow needeleandfoot on IG. I am amyinuk_ . Hiya Cheryl!!! I followed needleandfoot on both Instagram and Facebook. She has some lovely fabrics. Thanks for the giveaway. Hugs!!! I love all of Maureen's fabrics and just got my order of Garden Dreamer. After winning a few of the FQs, I just had to have them all. Following Needle and Foot on IG. I love Maureen's fabrics also! I'm following Needle and Foot on Instagram. following on IG. best of luck with your new shop. What a lovely gift for his teacher! I'm following needle and foot on Instagram. Super cute quilt - the hand stitching really adds a special touch! I followed Needle and Foot on Instagram. What a lovely bundle of fabric for the baby quilt! love it! This is such a pretty colour palette! I'm now following Needle and Foot on IG. This is really a pretty quilt. Feminine without being too pastel-y. I follow Bernie in IG and FBT. She's awesome! You did a nice job on your quilt. I am following Needle and Foot via Instagram and FB. Thanks for sharing the great giveaway! DARLING quilt Cheryl! I love the big stitch touch you added. Yay for another sweet baby girl in the world; my neighbour had her little one March 8 and I got to hold her at 3 days old! Nothing like it IMHO. I follow Bernie on Instagram! I love the baby quilt! What a wonderful gift. I'm following the Foot and Needle on Instagram. Thanks for the fun! I follow Needle & Foot on Instagram under jonquilsgrdn. Happy birthday baby girl!! Such a spring- like palette for her quilt. I'm following Needle & Foot on IG. Your baby quilt is so pretty! I love the fabrics and the big stitch quilting. What a sweet baby quilt. I follow on Instagram. Cute baby quilt. I am following on FB. Beautiful quilt Cheryl! I follow Bernie on IG and FB. So beautiful! And I didn't know you could use different weight threads in a sewing machine! 😳 I am following on Instagram now. I am a social media rebel and don't have either of those types of accounts :( , but your quilt is lovely and I am excited for this blog hop to see everyone's creations! Now following Needle and Foot on Facebook. What a clever name for a sewing site!! Loved the fabrics seen as I browsed the shop. Thanks for the introduction, Cheryl. ... And I love your *Wonderful* quilt!! That touch of hand quilting is SO perfectly lovely and personal... Makes it especially dear to the heart!! I have that bee fabric. I'm going to have to use it to make a quilt now. I'm following Needle and Foot on Instagram. I'm following Needle and Foot on Facebook. I now 'like' Needle and Foot on Facebook. Thanks for this chance! I hopped onto your Instagram page to follow you! Hi Cheryl: I already follow needle and foot on instagram. Fantastic new quilt! Following needle and foot in Instagram! Hi there. I'm following needle and foot on instagram. Thanks for the giveaway info. I follow on instragram where I learned of this hop. Super fun quilt and I especially like the use of the yellow strips! Love your baby quilt, and the stitching! I'm wondering what sulky thread is, and what size the quilt is? I'm now following Bernie on Facebook! I didn't realise Bernie had a FB page, but I'm following now. I am so useless with Instagram though, I so have it, but I STILL don't know how to use it properly. I now follow on instagram. Great fabric! I'm following Needle and Foot on Instagram. Beautiful things! I'm following Needle and Foot on Instagram. The baby quilt was beautiful. I especially liked the quilting you did - both machine and hand! It's really a cute baby quilt! I'm following her on FB. Following you both on Instagram. Great quilt, great gift! Thanks for the chance. I follow Needle and Foot on Bloglovin. I'm following on Instagram. I like your non-traditional take on a baby quilt! I'm following on Instagram as WalkingWithFeathers! WOW - your quilt is beautiful - and I'm following Needle and Foot via FB - thanks. I am following Needle and Foot on Facebook (MPaula Whelan). I love how the big hand stitching looks like a dotted border around the blocks as if they are framed. I'm a follower of N&F on facebook. 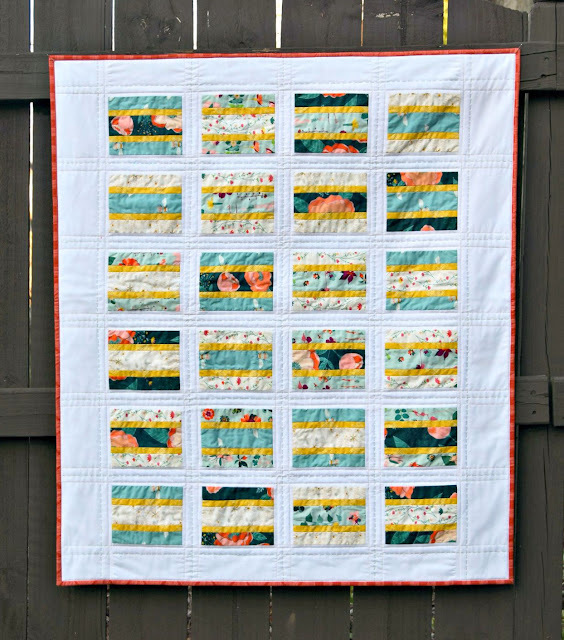 I love the stitching choices you made with this baby quilt Cheryl, especially the light green pearl cotton hand stitches. It gives it such a wonderful look! I'm following on Instagram, where I am @wordygirl11. I followed Needle and Foot on both Facebook and Instagram. What a beautiful quilt! I'm following on Instagram. Thanks! Hello! Love the blog tour! I follow Needle and Foot on Instagram and on Facebook! Love your quilt! Great way to use this beautiful bundle. I follow on Facebook as Calypso H.